MN family resort vacation season must be just around the corner since the sun is making it’s way north! Soon it will be setting directly in front of the resort again. I took this photo earlier this week when I drove into the resort one evening. 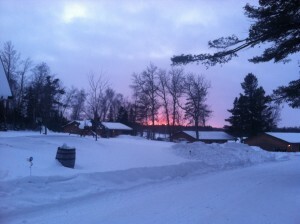 It’s probably just a pretty sunset to you but to us it represents the promise of a coming spring! That fact is hard to believe when the temps outside are into the teens below zero. However, just a few short weeks ago the sun was setting so far to our south that we wouldn’t see it set at all in the afternoon. Now it has moved back in our direction just enough for us to see the sun from the resort as it sinks behind the trees. The snow sliding off the roof of the play set made a curly cue ice sculpture that held on even through some strong winds early this week! That was one of the many things that struck me as amazing when we first moved north. The sun travels an amazing distance in the sky during the year! That is probably a “duh” observation for those of you who are stargazers. It certainly wasn’t always so obvious to me but now it has become the way I mark the time in anticipation of the Minnesota family vacation season! In June on the longest day of the year I will stand on our beach facing west and the sun will set behind Elm Point well to our north. In December on the shortest day of the year I might stand on the beach (depending on how cold it is!) and the sun will set so far to the south that I couldn’t see it even if I stood out in the cold to watch the sun set. For some reason that phenomenon just blows my mind. It’s amazing that in June it won’t be dark outside until after 11:00 p.m. and in December it’s already dark by 4:30! Anyway, I told you all that so that you would understand the JOY I felt when I could actually see the sun setting over Riverbirch Lodge. It might be a frosty 9 degrees outside tonight with 2 feet of snow on the ground but I know that the days are getting longer. That means soon enough we’ll cast off this blanket of winter and layer on some sunscreen. Who’s with me?! 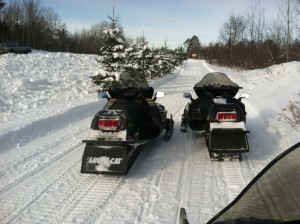 We spent much of President’s Weekend on area snowmobile trails! President’s Weekend was a nice long weekend at home with the girls. 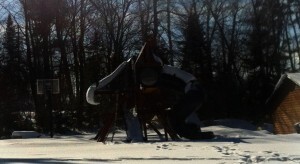 We did some snowmobiling with friends but not a lot else! Snow conditions are still really good for snowmobiling but the deep snow on the lake makes driving trucks or ATVs on Bass Lake a challenge. We are recommending that our guests travel out to ice fish by snowmobile from Wildwood or head around to the public access off of Pincherry Road to drive out. Someone plowed a road again this year from the access to the favored fishing hole on the south basin. 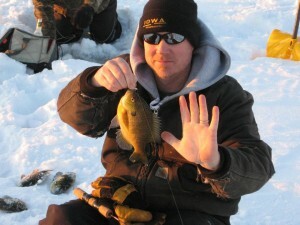 Jay was out with friends over the weekend and they caught very nice sunfish! Check out the Visit Grand Rapids Calender of Events for information on things to do during your stay in our area! 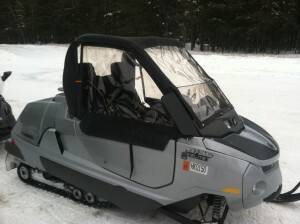 I’m sure there’s a name for this Ski-doo two-seater but I just call it “Cool! !” The photo doesn’t show it well but they had an infant car seat strapped into this buggy! 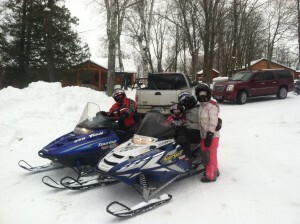 We love snowmobiling with friends!